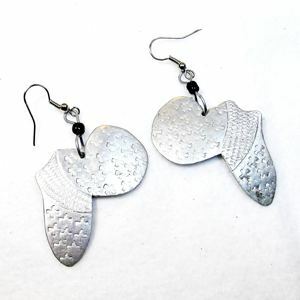 Earrings in the shape of Africa with hand hammered patterns. Very light metal. Height approx. 4.5 cm (measured without the hook). Hook is made of surgical steel, so allergy free. Width approx. 3.5 cm. All jewellry items are handmade, are therefore unique and can vary in size, appearance, colour and shape.